For a person to feel low or blue in their life at some point is a natural part of their life process. Depression arrives for reasons when people are let down by others, if certain things go wrong, hope on our dreams have been lost etc. And this depression feeling can stretch from a number of weeks to months and even years. People lose their ability of interacting with other human beings and they cannot enjoy their life to the fullest. This is the time they have to realize that something needs to be done about this depression. Depression is a treatable condition when the person has the right information available and a good doctor to help them out. The following mentioned are few tips on beating depression and also on how to overcome depression. The first step of knowing that the person has been suffering from depression is actually realizing that they are going through a depression. Then only they can move forward to the next step that would be getting treatment for this specific reason. It may be any mild depression symptoms which may be causing sadness in the life of the individual. Sometimes, the person cannot identify any ongoing depression in their life. So going through that depression they will find it very difficult to cope up with their life. This depression may even be through certain medical conditions or treatments or any other side effects. So taking help from a doctor is the best way of treating such a problem. The doctor can help cure any physical causes to such a depression. Even help can be provided for any medical conditions. The best way about understanding the depression in a better way is by researching completely about the depression. After knowing that the individual is going through a depression, the person must start getting knowledge about it. It will make them realize that the depression is very much real and it should be treated very seriously. Some of the ways of doing so are. Going to the local library and reading books as per the age group and what type of depression they are going through. Visiting online sources which are trusted enough to provide information and help in understanding the depression in a much better way. Depression can be treated by reading which is known as “bibliotherapy” which is highly motivating and beneficial. The person can also gain their knowledge and educate others about their ongoing condition and make them feel better. Meeting with a mental health therapist is one of the best solutions for getting rid of a major depression. Physiotherapy is one of the best ways of treating the depression. If the person is comfortable with the therapy then they can share things in a much better way. There are 3 most beneficial ways of going for a therapeutic approach. Cognitive behavioural therapy: Here the therapist and the patient believe in working together to point all details of the ongoing problem and change any negative thoughts that arise. Dialectical behaviour therapy: This targets any kind of unhealthy behaviours by providing the necessary skills to adapt to such situations in a much better way for the future. Interpersonal psychotherapy: This is a treatment used for any mood disorders. Here all the symptoms of depression leading to this are focused, if any interpersonal relationships are affected. This is most effective for any mild form of depression. If the person isn’t comfortable with taking anti-depressants, then let the doctor know about it. Be clear with him about this. Doing some research so that the person should be able to convince the doctor. If the person is comfortable with taking prescribed medications but not anti-depressants, then look for any other alternatives to it. Acupuncture: Acupuncture has been used since a long time to keep the mind and body calm and at peace. So it can even remove any kind of depression that a person is going through. Music: Listening to music is one kind of self therapy. It can improve the mood of the person. So if the person is depressed then do not listen to any sad music, but hearing something enthusiastic and energetic will help a lot. Art therapy: Drawing or painting as well as creating designs bring out certain feelings of the person. Art therapists can also help the individual if they wish to practise this. Pet therapy: Pets are known to provide joy when they are with humans. So even if the person doesn’t have a pet they can bring one or visit someone else’s pet regularly. On doing this, slowly they start forgetting about their depression. Changes made in a person’s lifestyle can help a lot if they want to get rid of any depression. Sleeping well is very essential if a person wants to stay healthy and have a balanced life. If the person has a lack of sleep then they can have negative thoughts coming in their head. 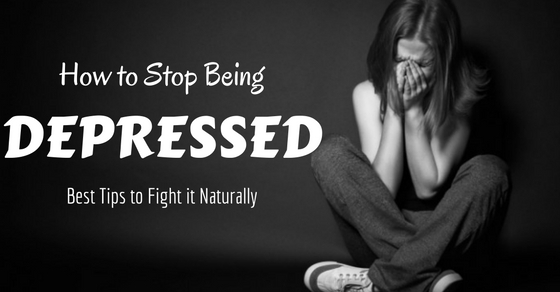 This will result in them not being fresh and tired throughout the day leading to depression. With this remember, even too much sleep can lead to tiredness and depression. Have a strict sleeping schedule of going to bed at one time everyday and getting up at the same time everyday. Do not exercise 3 hours before going to sleep. Remove anything distracting from the bedroom. Let the temperature of the room stay at a suitable temperature. Even reading books about how to fall asleep early can help in getting sleep early. Exercising has been proven to be effective in depression treatment since a long time. By exercising, the body releases a natural anti-depressant from within. This chemical can get a person to do something active in the day. Starting with a small and simple walk can make a big difference. And then gradually increase or carry out the workout as per the choice of the person. Working out with a partner rather than individually will help out the person in getting motivated. Working out or looking at friends can bring this motivation. Carry out or be a part of group exercise sessions. Look for activities which can release this chemical and help the person in staying active. Playing sports is one of the best ways of exercising in the day. This helps the person in meeting new people and surprisingly it shows lower sides of depressions. By eating the right and appropriate foodstuffs, there can be a change in the person’s attitude also. To reduce any common signs of depression a person should reduce their intake of sugar and any high sugary syrup along with fast food and processed foods. Consume more amounts of fruits and vegetables as well as whole foods. Drinking plenty of water will also help a lot. Researching on how to improve the diet can get the person show some changes within them and improve their mood. When the person is in a depressed state, it is likely that they will not pay attention to their clothing or appearance on a daily basis. So, the person needs to pay more attention to the way they dress up and groom everyday. It will help in improving their mood and cheer them up. Things like getting a new haircut or new clothes and a new pair of shoes can help in improving the person’s mood. Then concentrate on parts which the person loves about them and avoid the other dislikes. Getting support and love from people who are caring about the individual is very important if the person wants to get healed quickly. Letting people know that what depression the person is going through would help them in understanding depression and gaining their sympathy. Being honest about things that are irritating the person is the best way in sharing it to the people they trust. If these people are the reason for depression, then the person should let them know about it and then maintain their space. A positive person will bring positive thoughts with people around them and a negative person will bring negative thoughts. Certain friends and colleagues as well as family members who are good to talk should be around the person more often. When the person spends time with such people, they realize a change in their behaviour. They understand that there are people who even think in a much positive way about negative things and hence they learn from them. Being busy is one of the best ways to prevent any negative thoughts from entering into the person’s mind. It can make a huge difference by eliminating any negative thoughts from within the person and thus getting over depression can change the way they begin their day. The person should have a hobby for themselves. Which they know that will be enjoyed by them. Having pets around the house brings out a caring nature towards them. They also need to be fed, groomed, taken out for walks and played with. So this can help in diverting the mind of the person from the depression. Making a schedule for the entire day of all the tasks will be essential. It will make the person understand that everything has to happen in a proper way and do everything at the right time. Keeping things written in a book or a journal will help the person in bringing out their feelings. This should be done in a very personal and private place. Here the person can even share any of their darkest thoughts in their life as no one will judge them in this aspect. So if the person is suffering through a depression, do maintain a diary as this can bring down the mood of a person. For any depression to go away from a person, it is very important that they stop thinking about any negative thoughts. A person who is depressed will mainly bring negative thinking into their minds. The person should be wise enough and obstruct any negative thinking coming in their mind. Select the thoughts coming into the mind and then remove all the negative thoughts. This would be a great way for overcoming depression. Once a person goes through a depression they have the fear that this depression may come back in their life. The person becomes vulnerable to such a situation and they know that there is a higher chance of the depression returning. So identify any depression signs that are warning enough for it to return. If it is returning then immediately go and consult a doctor or a therapist and start with the treatment of depression right away. So for dealing with depression going on in the life of an individual, they can refer to any of the techniques mentioned above which will help them in coping with depression and turning their life around.